I love custard. 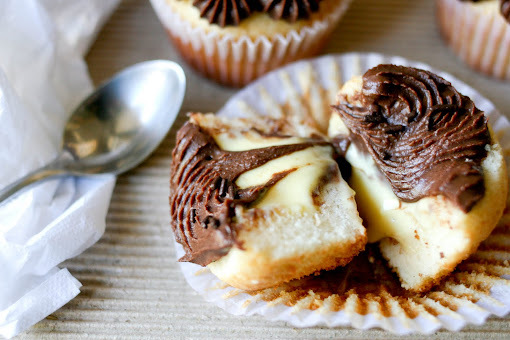 I've used my simple recipe in Cream Puffs, Fruit Tarts, Banana Cream Pie and now Boston Cream Pie Cupcakes, and it seriously has never failed me. It's simple, easy and always uber creamy and delicious. I made these for a friend who just turned 21 and originally intended on making a 'White Russian' Cupcake filled with Vodka cream and topped with Kahlua Buttercream. Good thing I tested a little of the Vodka cream first because blehhh. I'm sure Vodka fanatics would have loved it, but I think that for me, Vodka in cream didn't taste too great. So I used the rest of the non-Vodka cream to fill these little things. I topped the cupcakes with some luscious chocolate ganache and there you have it! A mini Boston Cream Pie cupcake! I believe my friend's words were, "Wow these are the best cupcakes I have ever tasted." Even though he hasn't tasted that many at all, I'll still gladly take that as a compliment. Original cupcake recipe can be found here. 1 cup of whole milk ONLY, no substitutions! Preheat oven to 350 F. Line a cupcake tin with liners and set aside. In a bowl whisk together the flour, baking powder and salt. Cream butter and sugar until light and fluffy. Beat in egg, making sure it is well incorporated. Beat in vanilla, add flour in three batches, alternating with milk. DO NOT over beat. Divide batter among cupcake tins and bake for 15 - 20 minutes or until an inserted toothpick comes out clean. Cool completely before frosting. For the custard, whip everything together until pudding has become thick, about 8 - 10 minutes. 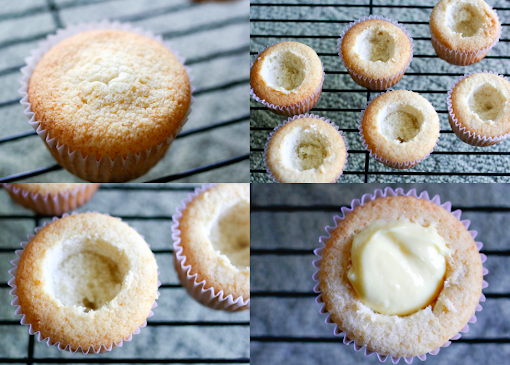 Once the cupcakes are cool, use the cone method to remove the tops, then fill it in with custard and replace tops. To make the ganache, place the chocolate in a large bowl. Heat the heavy cream on medium high until it comes up to a boil. Remove from heat and immediately pour over the chocolate. Let sit for 2 minutes then stir until completely melted and glossy. To pipe the ganache, allow the ganache to completely cool and set up. When you are able to spoon the ganache and and it can hold its texture it is ready to pipe. Now, that's a GREAT cupcake! 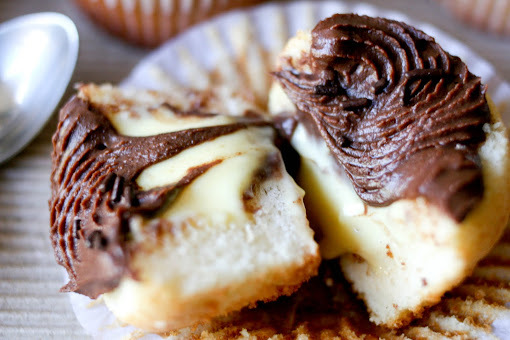 I love vanilla cake, chocolate frosting, and custard!! Must. Make. Soon! I LOVE custard and your inside shots are making me drool. My bf loves caramel frosting, so for his last birthday I made him a variation of boston cream pie with penuche instead of chocolate frosting that made us both very happy. My Dad would love these! He's a huge fan of boston cream pies. Btw, I love the photos of the cupcake cut in half. Your cupcakes are gorgeous! I love the perfect crumb. Amy's recipe is one of my favourites. I love the way you piped your swirls. wow che delizia!!! favolosi!!! complimenti! Michelle I'm saving this recipe for the rest of my life! Holy moly cow omg! I think I've died and gone to cupcake heaven. 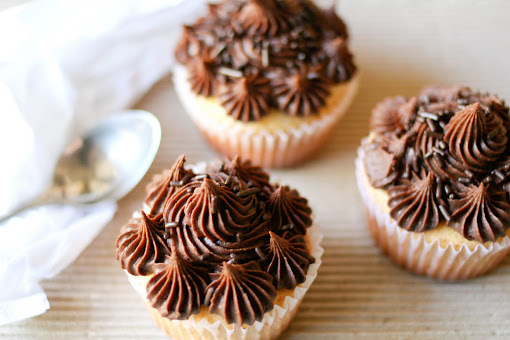 Oh my - I am literally drooling over these cupcakes they look like absolute perfection! Does it matter if I use whole-wheat flour in these? Looks delicious!!! No I don't think it should matter much but I can't really say, but most recipes I see that use whole wheat flour tend to mix 1/2 all purpose flour with 1/2 whole wheat so that it won't end up tough perhaps? 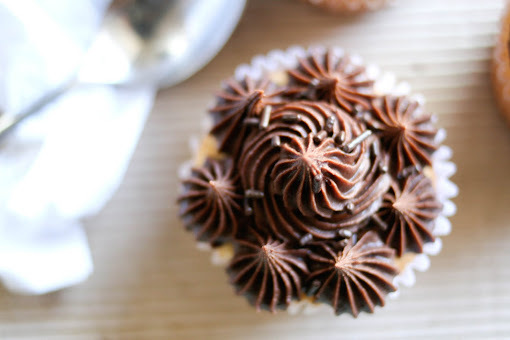 I was wondering what sort of decorating nozzle (style/size/shape)you used to pipe the ganache on the tops? They're so cute! I used a 4B wilton tip and thanks! Just wondering how big is the packet of french vanilla pudding that you used? Where I am, they come in 100g sachets. Just want to make sure I have everything in the right quantities before I attempt to make the custard filling. Making this recipe right now! Your ingredients list for the BCPCs says "1 large eggs," but your directions say "Beat in egg, one at a time, making sure they are well incorporated." Can you confirm the number of eggs, please? Just one, or perhaps more, due to the "one at a time"? Thank you! Oops sorry! It's 1 egg but I just reduced the recipe from the original which is why it seemed like it was meant for more than 1. Fixed it, enjoy! Gosh, I just love your blog and all of your recipes!!!!! These cupcakes look SO good! i tried this recipe, however, my cupcakes came out a bit hard. is that how they're supposed to be? do you have any tips on how to make them soft, moist, and fluffy?